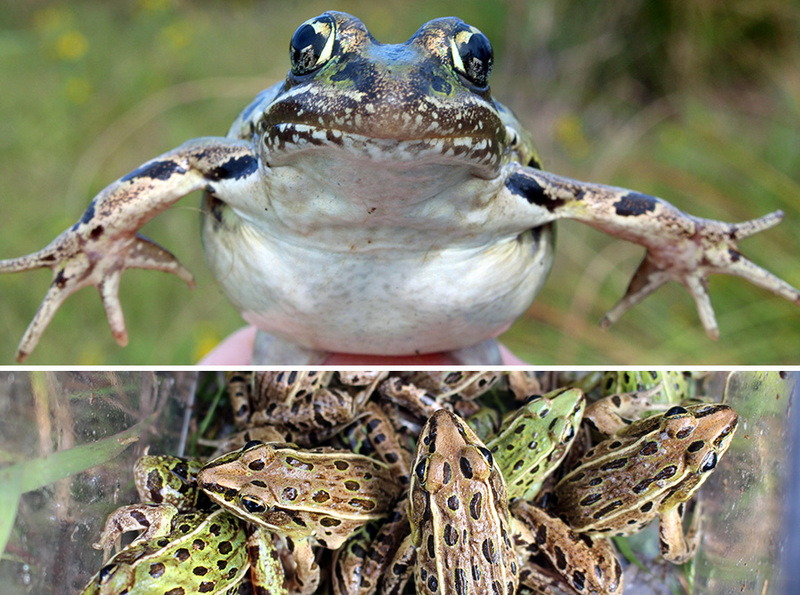 Months of old-fashioned scientific fieldwork - more than 2,000 surveys of chirping frog calls, hundreds of photos of individual frogs and tiny tissue samples taken from them - has helped define the range and unique characteristics of the recently discovered Atlantic Coast leopard frog. A study published this month in the journal PLOS ONE pinpointed the frog's range along the Eastern Seaboard, its unusual call and a list of traits distinguishing it from the more common northern and southern leopard frogs. "We are essentially writing the field guide page for this frog. It's much of the information you'd want," said Matthew Schlesinger, a zoologist with the ESF- based New York Natural Heritage Program. Given the challenges associated with hearing one frog and then finding and processing it in an expansive wetland, the researchers essentially triangulated their way to the information they were seeking. "Hearing a particular frog call, then going out, finding and catching it is pretty much an impossible task," Schlesinger said. "It doesn't happen that way." So, based on call surveys, they documented which frog species lived in which wetlands, then caught individual frogs from those wetlands for genetic and photographic analysis. The call surveys were conducted from Massachusetts to North Carolina. A team of 19 scientists and a cadre of field assistants ventured into wetlands up and down the East Coast in 2014 and '15 to listen for and record the "chuck" sound that sets the Atlantic Coast leopard frog apart from other species of leopard frogs. When possible, the scientists captured a frog, photographed it from multiple angles and clipped a tissue sample from its toes. The tissue underwent genetic analysis at UCLA. "It's very old-fashioned field work," Schlesinger said. "You go out and do survey work and catch some animals. You look at their characteristics. And then you bring in some modern technology." The work resulted in the first field-verified range map for the species, which lives primarily in coastal plains from Connecticut to northern North Carolina. Schlesinger and colleagues first described the Atlantic Coast leopard frog as a distinct species in a study in PLOS ONE in 2014. Other authors on the most recent paper represent Rutgers University and conservation agencies in Connecticut, Delaware, Maryland, Massachusetts, New Jersey, New York, North Carolina, Pennsylvania, Rhode Island and Virginia.